It's Halloween! And, it's Friday! Wooohoo! One of my favorite "holidays" and my favorite day combined... Great! I'm determined to have a good day today... I have a backache that has been trying to ruin that determination during the whole week, but even though I will probably have to continue being careful with my movements, I really want to enjoy this day. We usually dress up at work and have a get together in the afternoon. Best costumes are chosen and we really have fun. So, wish me luck! So, let's give thanks. Let's not wait until Thanksgiving Day to give thanks. For this card I stamped the big jar with brown ink, and then applied "red" with sponge for a background. Then stamped this great sentiment stamp about Thanksgiving. Tied some baker's twine around neck/cap and positioned with dimensional adhesives on top of distressed patterned paper. I know... it's Halloween and I am sharing a Thanksgiving card. This is Scrapper Myra LOL! I promise to share in future posts more of Halloween projects I have pending to share and photos of today's craziness. For now, leave a comment for the chance to win with Unity Stamp Co, because I am linking this to Friday Friends with Flair. Have a great weekend and don't forget to give thanks. Very cute card. I love this stamp. What a fun card! Love the jar and the sentiment is super cute! Thanks in a jar, very nice. Love the colors. Love this HUGE image and the colors you used! 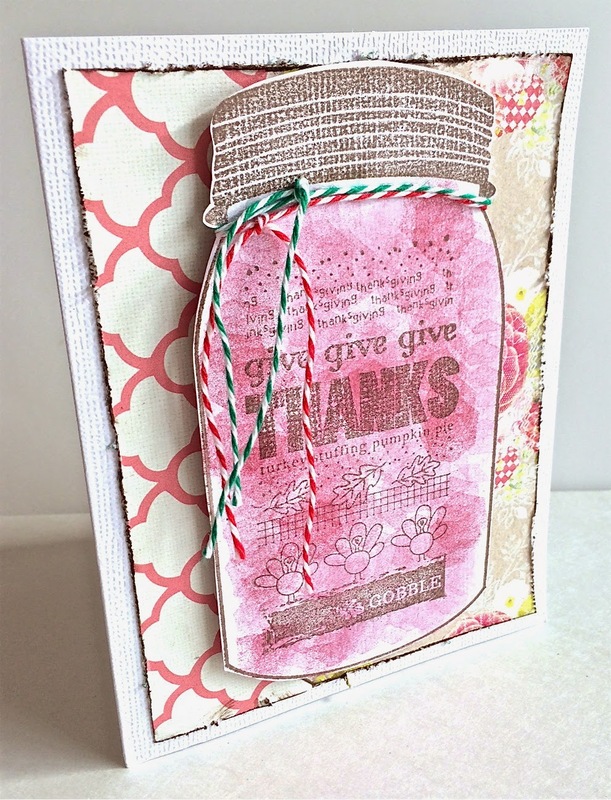 Your canning jar looks awesome with the sentiment inside, and the distressed paper. Love all the different things you did. I like how you stamped this great sentiment on the jar. The card is wonderful! I hope you had fun. . Cute card! Hope your back feels better! Witch is not a bad thing?